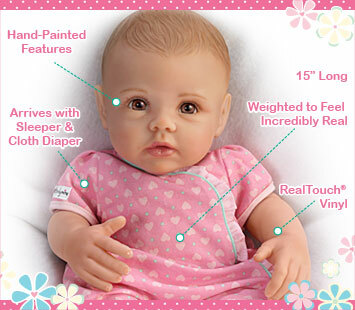 Perfectly sized at 15 inches long, this realistic toy baby doll is handcrafted of soft RealTouch® vinyl, just like our high-end collectible dolls. Meticulously hand-painted to enhance her beautiful features, from her sculpted light brown hair and eyebrows to the soft blushing of her chubby cheeks, this beautiful baby girl arrives in a soft pink sleeper trimmed with ribbon ruffle and a cloth diaper, perfect for snuggling! Strong demand is anticipated, so don't delay. Order now!